For the equivalent women's tournament, see ICC Women's T20 World Cup. For the ICC Twenty20 ranking scheme, see ICC T20I Championship. The ICC T20 World Cup (earlier known as ICC World Twenty20) is the international championship of Twenty20 International cricket. Organised by cricket's governing body, the International Cricket Council (ICC), the tournament currently consists of 16 teams, comprising the top eight teams from the rankings at the given deadline and four other teams chosen through the T20 World Cup Qualifier. All matches are played as Twenty20 Internationals. The event has generally been held every two years. However, the next edition of the tournament is scheduled to take place in 2020 in Australia, four years after the conclusion of the 2016 edition. 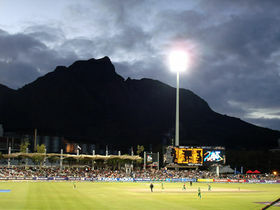 In May 2016, the ICC put forward the idea of having a tournament in 2018, with South Africa being the possible host. But at the conclusion of the 2017 ICC Champions Trophy, the ICC announced that the next edition of the World T20 would take place in 2020 in Australia, as originally scheduled. Six tournaments have so far been played, and only the West Indies, who currently hold the title, has won the tournament on multiple occasions. The inaugural event, the 2007 World Twenty20, was staged in South Africa, and won by India, who defeated Pakistan in the final at the Wanderers Stadium in Johannesburg. 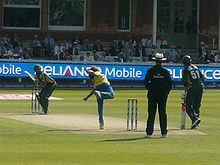 The 2009 tournament took place in England, and was won by the previous runner-up, Pakistan, who defeated Sri Lanka in the final at Lord's. The third tournament was held in 2010, hosted by the countries making up the West Indies cricket team. England defeated Australia in the final in Barbados, which was played at Kensington Oval, winning its first and the only international tournament to date. The fourth tournament, the 2012 World Twenty20, was held in Asia for the first time, with all matches played in Sri Lanka. The West Indies won the tournament by defeating Sri Lanka in the final, winning its first international tournament since the 2004 Champions Trophy. The fifth tournament, the 2014 ICC World Twenty20, was hosted by Bangladesh, and was won by Sri Lanka defeating India, who became the first team to play in three finals. West Indies are the current World T20I holders, beating England in the 2016 final, winning their second title. When the Benson & Hedges Cup ended in 2002, the ECB needed another one day competition to fill its place. Cricketing authorities were looking to boost the game's popularity with the younger generation in response to dwindling crowds and reduced sponsorship. It was intended to deliver fast-paced, exciting cricket accessible to thousands of fans who were put off by the longer versions of the game. Stuart Robertson, the marketing manager of the ECB, proposed a 20 over per innings game to county chairmen in 2001 and they voted 11–7 in favour of adopting the new format. The first official Twenty20 matches were played on 13 June 2003 between the English counties in the Twenty20 Cup. The first season of Twenty20 in England was a relative success, with the Surrey Lions defeating the Warwickshire Bears by 9 wickets in the final to claim the title. The first Twenty20 match held at Lord's, on 15 July 2004 between Middlesex and Surrey, attracted a crowd of 27,509, the largest attendance for any county cricket game at the ground other than a one-day final since 1953. Soon after with the adoption of Twenty20 matches by other cricket boards, the popularity of the format grew with unexpected crowd attendance, new domestic tournaments such as Pakistan's Faysal Bank T20 Cup and Stanford 20/20 tournament, and the financial incentive in the format. The West Indies regional teams competed in what was named the Stanford 20/20 tournament. The event was financially backed by convicted fraudster Allen Stanford, who gave at least US$28,000,000 funding money, the fruit of his massive Ponzi scheme. It was intended that the tournament would be an annual event. Guyana won the inaugural event, defeating Trinidad and Tobago by 5 wickets, securing US$1,000,000 in prize money. A spin-off tournament, the Stanford Super Series, was held in October 2008 between Middlesex and Trinidad and Tobago, the respective winners of the English and Caribbean Twenty20 competitions, and a Stanford Superstars team formed from West Indies domestic players; Trinidad and Tobago won the competition, securing US$280,000 prize money. On 1 November, the Stanford Superstars played England in what was expected to be the first of five fixtures in as many years with the winner claiming a US$20,000,000 in each match. On 17 February 2005 Australia defeated New Zealand in the first men's full international Twenty20 match, played at Eden Park in Auckland. The game was played in a light-hearted manner – both sides turned out in kit similar to that worn in the 1980s, the New Zealand team's a direct copy of that worn by the Beige Brigade. Some of the players also sported moustaches/beards and hair styles popular in the 1980s taking part in a competition amongst themselves for best retro look, at the request of the Beige Brigade. Australia won the game comprehensively, and as the result became obvious towards the end of the NZ innings, the players and umpires took things less seriously – Glenn McGrath jokingly replayed the Trevor Chappell underarm incident from a 1981 ODI between the two sides, and Billy Bowden showed him a mock red card (red cards are not normally used in cricket) in response. Lasith Malinga bowling to Shahid Afridi in the 2009 Final at Lord's. It was first decided that every two years an ICC World Twenty20 tournament is to take place, except in the event of a Cricket World Cup being scheduled in the same year, in which case it will be held the year before. The first tournament was in 2007 in South Africa where India defeated Pakistan in the final. Two Associate teams had played in the first tournament, selected through the 2007 ICC World Cricket League Division One, a 50-over competition. In December 2007 it was decided to hold a qualifying tournament with a 20-over format to better prepare the teams. With six participants, two would qualify for the 2009 World Twenty20 and would each receive $250,000 in prize money. The second tournament was won by Pakistan who beat Sri Lanka by 8 wickets in England on 21 June 2009. The 2010 ICC World Twenty20 tournament was held in West Indies in May 2010, where England defeated Australia by 7 wickets. The 2012 ICC World Twenty20 was won by the West-Indies, by defeating Sri Lanka at the finals. For the first time, a host nation competed in the final of the ICC World Twenty20. There were 12 participants for the title including Ireland and Afghanistan as 2012 ICC World Twenty20 Qualifier. It was the first time the T20 World Cup tournament took place in an Asian country. The 2012 edition was to be expanded into a 16 team format however this was reverted to 12. The 2014 tournament, held in Bangladesh was the first to feature 16 teams including all ten full members and six associate members who qualified through the 2013 ICC World Twenty20 Qualifier. However the top eight full member teams in the ICC T20I Championship rankings on 8 October 2012 were given a place in the Super 10 stage. The remaining eight teams competed in the group stage, from which two teams advance to the Super 10 stage. Three new teams (Nepal, Hong Kong and UAE) made their debut in this tournament. All ICC full members qualify automatically for the tournament, with the remaining places filled by other ICC members through a qualification tournament, known as the T20 World Cup Qualifier. Qualification for the inaugural 2007 World Twenty20 came from the results of the first cycle of the World Cricket League, a 50-over league for ICC associate and affiliate members. The two finalists of the 2007 WCL Division One tournament, Kenya and Scotland, qualified for the World Twenty20 later in the year. A separate qualification tournament was implemented for the 2009 World Twenty20, and has been retained since then. The number of teams qualifying through the World Twenty20 Qualifier has varied, however, ranging from two (in 2010 and 2012) to six (in 2014 and 2016). In case of a tie (that is, both teams scoring the same number of runs at the end of their respective innings), a Super Over would decide the winner. In the case of a tie occurring again in the Super Over, the match is won by the team that has scored the most sixes in their innings. This is applicable in all stages of the tournament, having been implemented during the 2009 tournament. During the 2007 tournament, a bowl-out was used to decide the loser of tied matches. The International Cricket Council's executive committee votes for the hosts of the tournament after examining bids from the nations which have expressed an interest in holding the event. After South Africa in 2007, England, West Indies and Sri Lanka hosted the tournament in 2009, 2010 and 2012 respectively. Bangladesh hosted the tournament in 2014. India hosted the last edition of the tournament in 2016. In December 2015, Tim Anderson, the ICC's head of global development, suggested that a future tournament be hosted by the United States. He believed that hosting the event could help spur growth of the game in the country, where it is relatively obscure and faces competition by other sports such as baseball. The number in bracket indicates number of wins in tied matches by Super Overs and bowl outs, however these are considered half a win regardless of the result. The win percentage excludes no results and counts ties (irrespective of a tiebreaker) as half a win. The ICC does not adjudicate rankings but only rounds a team achieves e.g. Semis, round one etc. The table below provides an overview of the performances of teams in the ICC World Twenty20. The team ranking in each tournament is according to ICC. For each tournament, the number of teams in each finals tournament (in brackets) are shown. ^ "World T20 renamed as T20 World Cup". ICC. 23 November 2018. Retrieved 23 November 2018. ^ "ICC hopeful of World T20 return in 2018". ESPN Cricinfo. Retrieved 26 May 2016. ^ Mukesh Bhatt (18 June 2017). "Champions Trophy to take place in 2021, No World T20 in 2018". Hindustan Times. Retrieved 19 June 2017. ^ "Samuels special the spur for epic West Indies win". Wisden India. 7 October 2012. ^ Weaver, Paul (25 May 2009). "Usman Afzaal gives Surrey winning start but absent fans fuel concerns". The Guardian. Retrieved 17 May 2012. ^ "Guyana crowned Stanford 20/20 champions". ESPNcricinfo. 14 August 2006. ^ "Dates for Stanford Twenty20 announced". The Jamaica Observer. 9 February 2006. Archived from the original on 5 December 2008. ^ "Udal leads Middlesex for Stanford". ESPNcricinfo. 3 October 2008. Retrieved 17 May 2012. ^ McGlashan, Andrew (27 October 2008). "Ramdin leads T&T to big-money glory". ESPNcricinfo. Retrieved 17 May 2012. ^ McGlashan, Andrew (1 November 2008). "Gayle leads Superstars to millions". ESPNcricinfo. Retrieved 17 May 2012. ^ "US tycoon charged over $8bn fraud". BBC News. 17 February 2009. Retrieved 17 May 2012. ^ "ICC World Twenty20 Qualifier to be held in Ireland". ESPNcricinfo. 13 December 2007. Retrieved 17 May 2012. ^ "ICC approves Test championship". Espncricinfo. Retrieved 22 March 2014. ^ "West Indies to start World T20 title defence against India". ICC. 27 October 2013. Archived from the original on 29 October 2013. Retrieved 27 October 2013. ^ "For next five years, all T20 action in subcontinent". The Times of India. 18 March 2011. ^ "International Cricket Council Targets World Twenty20 on United States Soil: Report". NDTV Sports. Retrieved 14 January 2016. ^ "Records / ICC World T20 / Result Summary". ESPNCricinfo. 16 March 2014. Wikimedia Commons has media related to ICC World Twenty20.